Such is the enduring myth that perhaps inspired some of the 23 men and women who pulled out of Fairbanks, Alaska, on Feb. 6, with dogsled teams to tackle the 1,000-mile-long Yukon Quest this year. No doubt the race was as exciting for the participants and crowd as the first contest in 1984. But things have changed in the 33 years since the first Yukon Quest, which celebrates the Yukon River as the super highway of its day, when prospectors raced to the area at the turn of the 20th century to find gold and make their fortune. The sport is changing. The dogs have changed. And, most certainly, the climate is changing. John Schandelmeier recalls that mushers used to run the Yukon Quest and other dogsled races for the opportunity to test themselves and to be with their beloved dogs in the Arctic hinterland. “Today’s world is quite different. In today’s world, a lot of people only have dogs to race,” says Schandelmeier, a two-time Yukon Quest International Sled Dog Race champion. He and his wife, Iditarod veteran Zoya DeNure, live in the Delta Junction area about two hours from Fairbanks where they run Crazy Dog Kennel, which trains and rehabilitates unwanted sled dogs. 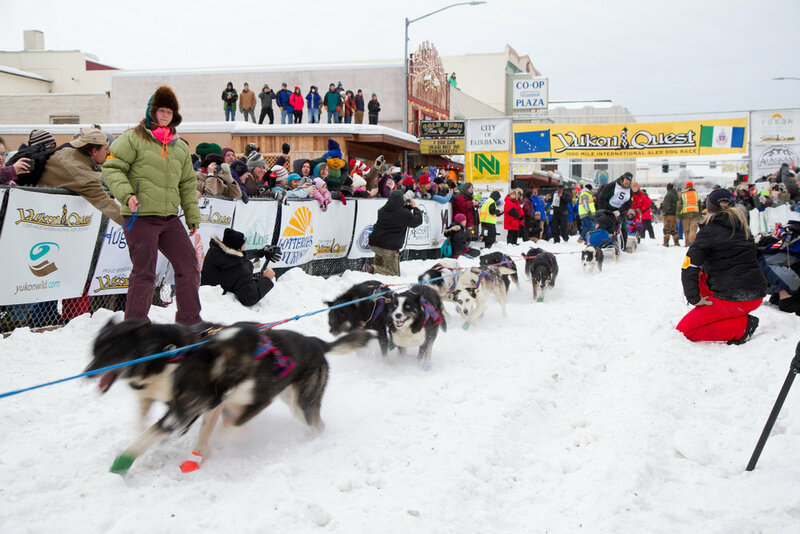 A native Alaskan who spends every moment possible in the outdoors, Schandelmeier says for him racing dogs is like a vacation. In the past, what some might call the “old days,” people employed their dogs in everyday tasks like hauling water and wood, in conditions that were likely pretty harsh. As dogsledding became a sport – a very competitive sport – sled dogs were bred more for their speed and stamina. The dog generically known as the Alaskan husky is a totally different animal than it was just a few decades ago, according to Schandelmeier. For instance, Sonny Lindner, the first Yukon Quest champion, finished the race in a little more than 12 days. Compare that to this year’s eventual champion, Alaska’s Hugh Neff, who came across the finish line in Yukon, Canada, in a time of 9 days, 1 hour and 25 minutes. 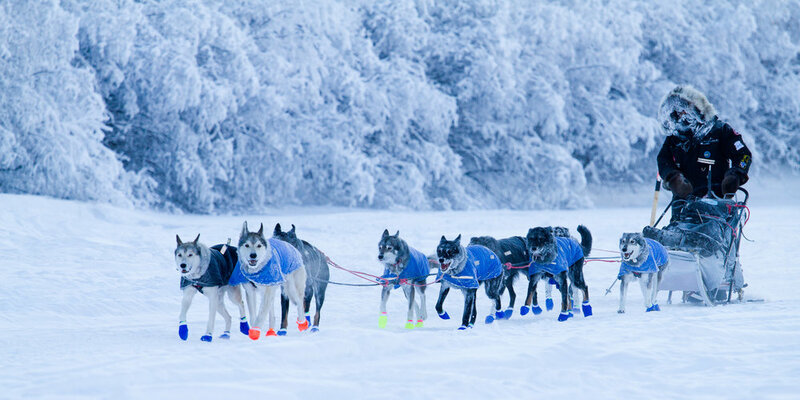 Such endurance has rightfully earned sled dogs the reputation as one of the animal world’s great athletes. It has certainly earned them the respect of Dr. Michael Davis, a professor and veterinarian at the Oklahoma State University who has conducted research on these animals for about 15 years. “They’re the Arctic equivalent of an Ethiopian marathon runner,” notes Davis, who was originally interested in studying the canines to understand exercise-induced asthma in human athletes. The opportunity to work with sled dogs came in 2001, when officials with the Iditarod – dogsledding’s version of the Tour de France – agreed to let Davis have access to the animals if he would help them with a gastric ulcer problem that was killing two or three dogs each year. It turned out that the dogs weren’t great models for the asthma study, but Davis was eventually able to devise a strategy of medication and treatment that was nearly 100 percent effective in preventing the ulcers. He then turned his attention to what made Alaskan huskies such superb athletes. “Everything that I think that makes them unique is in their muscle,” Davis explains. The dogs are more efficient at getting fuel from their bloodstream into their muscle cells. They also have a much greater capacity to burn energy once it’s in the muscle, possessing five times as much mitochondrial content in their cells as a human and twofold that of the average racehorse. Mitochondria are specialized units within a cell, surrounded by a membrane, that serve as a sort of cellular power plant that uses oxygen to generate most of the cell’s supply of adenosine triphosphate, which it uses as a source of chemical energy. In a way, Davis explains, the dogs are freaks of nature, an anomaly in evolution. Evolution is a bit like a frugal car buyer, almost always favoring the standard model, eschewing all the bells and whistles that come with an upgrade. The Alaskan husky racing dog is an overbuilt car with an engine – muscle – teeming with idle proteins waiting to be revved up. Davis notes that the ability of sled dogs to adapt quickly to exercise may also explain why they live longer than a canine of similar size. Dogs generally age inversely proportional to size; the larger the dog, the shorter the lifespan. “Our contention is that the biological process that allows them to adapt so quickly to extreme stresses is also responsible for them to be more resistant to aging,” says Davis, noting that federal agencies from the Department of Defense to the National Institutes of Health are interested in learning more about such adaptability and what implications it may have for two-legged animals. How well the dogs and the sport of dogsled racing in general will adapt to a changing climate is just as difficult to understand and predict. It’s no secret that Arctic climate is changing. Climate models predict continued warming throughout Alaska including the Yukon Quest course, according to Rick Lader, a PhD candidate with the Alaska Center for Climate Assessment and Policy. ACCAP is housed inside the International Arctic Research Center at the University of Alaska Fairbanks. Over the entire 90-year instrumental record available for the Southeast Interior of Alaska, temperature has increased 0.3 degrees Fahrenheit per decade while precipitation is relatively flat, Lader says. The Yukon Quest course generally skirts the northern edge of the Southeast Interior before diving south into the Yukon. Perhaps nobody knows better how the weather and long-term climate affect the Yukon Quest course along the river than Patrol Sgt. John “Mitch” Mitchell of the Canadian Rangers. Each year, Mitchell and his team use snowmobiles to break a trail for the Yukon Quest on the Canadian side of the race as part of their winter training exercises. “The only thing about a trail that is constant is change. It’s always changing, day to day, hour by hour,” Mitchell says. Certainly each year is different. There are winters with deep snow and winters with snow so thin that the Canadian Ranger patrol has recommended against using parts of the course due to the danger to both mushers and dogs to run the race safely. The level of the river is particularly crucial to the safety and viability of the course, according to Mitchell. If the river starts to freeze while still high, it will take longer to turn to ice – and the ice will be much thinner. Warmer temperatures cause the ice to break and then jam down river in a domino effect. This year’s finish line in downtown Whitehorse was moved to Takhini Hot Springs due to deteriorating trail conditions, though that was mostly because of local conditions specific to the area around town, according to Mitchell. 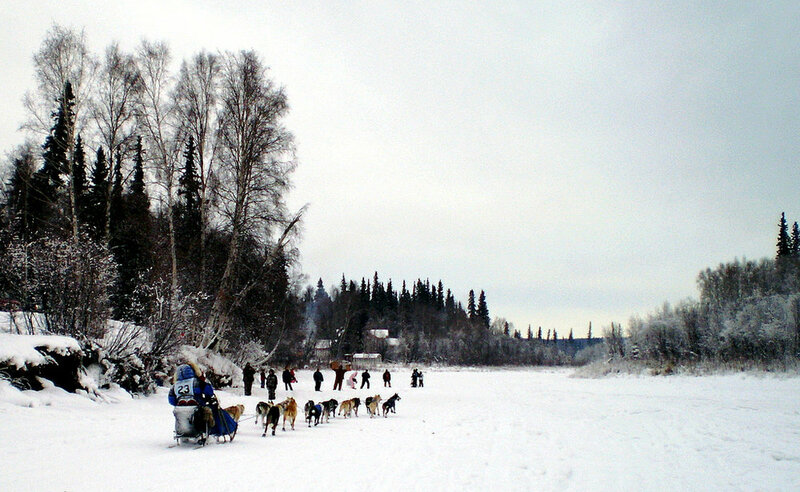 Schandelmeier doesn’t dispute the realities of climate change in Alaska – willows and cottonwoods grow bigger and in greater numbers in his favorite trapping grounds – though he is skeptical that it directly affects the Yukon Quest. In 1984, the first year of the race, sections of the course had open water along the river, he recalls. On the other hand, Davis insists the warmer winters affect both the course and the sled dogs, which can overheat and become dehydrated if the musher doesn’t manage the conditions correctly. “Ultimately, it does slow the race down some,” he says. “You’re spending more time cooling the dogs down and less time running.